The five Birmingham venues that make up the Bitters ‘n Twisted family are offering a special treasure hunt during January. The Bitters ’n Twisted Cocktail Trail offers thirsty drinkers the chance to collect four stamps in each of the city centre venues: Bodega, The Jekyll & Hyde, Island Bar, The Victoria or The Rose Villa Tavern in the Jewellery Quarter. Once a card has four stamps from four different venues, the fifth venue will offer completed card-holders a hand-crafted cocktail on the house, gratis, completely free. 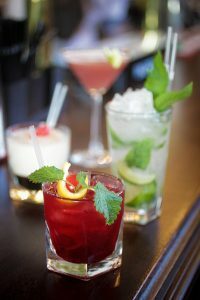 Matt Scriven, director of Bitters ’n Twisted, said: “Once the hustle and bustle of the festive season passes those nasty January blues can kick in – give them the boot with a tasty cocktail on us! People can reward themselves however they choose to, we serve a range of drinks from the saintly ‘skinny’ style cocktail to a list of more sinful, decadent creations. 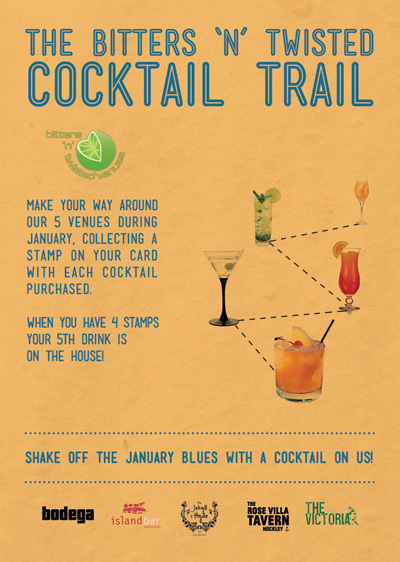 We encourage people to strike up a conversation with our talented team to discuss what drink they would like to enjoy while collecting stamps to earn a post Christmas present” The Bitters’n’Twisted Cocktail Trail runs throughout the whole of January. Only one stamp per venue per cocktail and multiple stamps will not be given out to fill a card at one venue. There is no limit to which cocktails are purchased or how many cards can be filled out and exchanged during the month.